Considering that there is virtually zero snow in the Sierras right now, and not really to my surprise, legendary Sierra Slayer Glen Poulsen and friend Sarah hightailed it to Jackson on New Year’s Eve for a few days of skiing in the Tetons. Unfortunately, I’m smack dab in the middle of my work week, but I was able to scrounge a day off and get out skiing with them yesterday. We even found some pretty stable snow out there. Pinky sunrise in the north end of GTNP. Wanting to get further away from the masses, we ventured north to ski something on the west side of Jackson Lake. I had heard about folks ice skating on the lake for weeks now, so I figured an attempt at a ski crossing was warranted. We got a nice sunrise start, which was beautiful with lots of pink popping in the sky as the sun came up. Unfortunately though, we had to turn around less than a mile into the crossing due to an extremely slushy ice surface. Crossing the lake in these conditions can be a nightmare, and anyone that thinks skiing across a frozen lake is nothing special, should go up there and see what it’s all about right now, as a successful crossing is never a guarantee. Skinning to the top of Peak 10,696. Anyway, after our aborted lake mission, we headed back down to the south end of the park and set our sights on skiing Peak 10,696. We approached via Maverick and found the snow quite “locked-on” the Southeast Face of 10,696, so we dropped in and I was more worried about nailing rocks than being caught in an avalanche. The snow was actually quite wind hammered, but skied rather nicely with the warm temperatures of the day softening things up a bit. Dropping down into Stewart’s Draw via a line I call the Pube Chute, things warmed up even more and there will definitely be some sun-crusts developing on the the southerly aspects now. Glen skiing the lower section of Pube Chute. 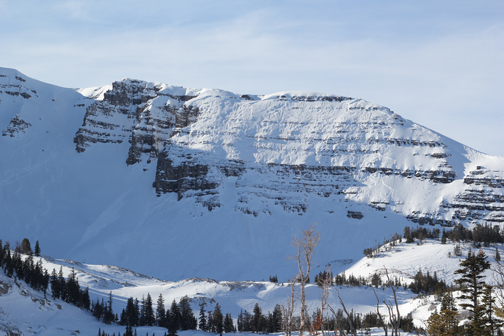 Though we found some very stable snow conditions, a snowboarder triggered a large slide while attempting to ski Pucker Face on Cody Peak outside of the backcountry gates at JHMR yesterday. (Click here for a close-up image of the slide.) This shows that there is some serious variability in snowpack stability right now, so choose your line wisely. Any word on the condition of the snowboarder? Lepistoir…snowboarder who triggered it did not get caught in slide…so he’s okay. Nice commentary about lake crossings. “Never a guarantee”… indeed. check out this pucker face avalanche video. i’m glad that snowboarder didn’t get sucked down with the slide, but i sure wish the person holding the camera kept it focused on the avalanche. probably best to try to keep your eyes on the parties involved though…eh? Okay, the guy with the camera should have his shooting license revoked immediately. Can’t believe he missed the whole thing. Should have taken one for the team. Ha!